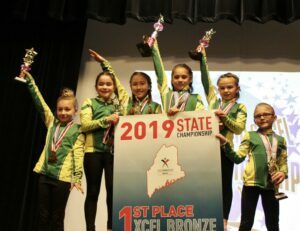 NORWAY — Eight-year-old gymnast Victoria Casia Sessions, of Norway, took first place overall in the Xcel Bronze Child Division at the USA Gymnastics Maine State Championship March 16 and 17 in Augusta. Victoria had the highest all-around score of the 373 gymnasts in the competition. 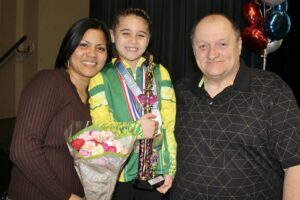 She won first place in all four events: Balance Beam, with a score of 9.425/10; Floor Exercise, with a score of 9.525; Vault, with a score of 9.300; and Uneven Bars, with a score of 9.350. 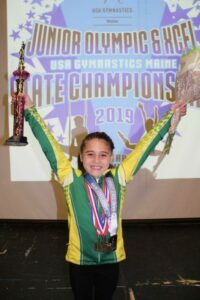 She was awarded a trophy as the overall 2019 USA Gymnastics Maine State Champion, with a total score of 37.6/40. Victoria and her Bronze Team members Delia Cloutier (with a total score of 36.625), Makayla Federico (with a total score of 35.250), Ade Heaward (with a total score of 36.225), Taylor Lawler (with a total score of 36.175), and Ayla Pelchat (with a total score of 36.800), earned the first place State Champion team banner in the Xcel Bronze Division, for their club, Oxford Hills Gymnastics in Mechanic Falls, coached by owner Melody Gammon, Ed.M. 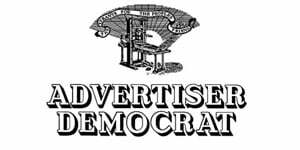 Gammon said the gymnastic club sent 14 gymnasts to the event. “All 14 of these girls worked hard all season and deserve to be recognized and celebrated by their community. “Since we are a private club, these gymnasts don’t get recognized for their athletic achievements by their schools,” she said. The Xcel Silver team – Nichole Wilson, McKenna Herrick, Ashley Niemi, Maggie Bristol and Maddie Adams – placed fourth in the competition. Nicole finished in the top seven all around finishers and qualified for the Region 6 Championships on the Super 7 State Team, as did McKenna, who finished eighth overall in Xcel Silver and will go as the Maine Xcel Silver All Star. The Region 6 Championships for all the top Xcel Silver, Gold, Platinum and Diamond gymnasts from New England and New York, will be held May 18-19 in Shrewsbury, Massachusetts. The club’s Xcel Gold team – Marlee Pratt, Cassie Turgeon and Sadie Kyllonen – also competed in the event and were state champions. For information about Oxford Hills Gymnastics, visit http://www.oxfordhillsgymnastics.com/.